The Seahawks, rarely active on the first day of free agency, jumped in and signed ex-Jacksonville OL Luke Joeckel, despite his disappointing career after winning the Outland Trophy at Texas A&M. Less than an hour into the NFL’s free agency period Thursday, the Seahawks made the first move to upgrade their 32nd-ranked offensive line by agreeing on a one-year deal with unrestricted free agent Luke Joeckel, 25, a four-year disappointment at tackle and guard for the Jacksonville Jaguars who is coming off knee surgery. Reports say with incentives, Joeckel could earn up to $8 million. If that is the case, the Seahawks will invest almost as much in Joeckel in 2017 as they did their entire starting offensive line in 2016 ($8.2 million). Joeckel won the 2012 Outland Trophy and was a unanimous All-America selection at Texas A&M before the Jaguars made him the No. 2 overall pick in the 2013 draft (behind OT Eric Fisher, selected by Kansas City). Joeckel signed a four-year contract that included a $13.8 million signing bonus, but played in only five games at right tackle as a rookie when an ankle injury wiped out the rest of his season. Joeckel returned in 2014 but did not distinguish himself. Pro Football Focus rated him among the worst tackles in the league after he allowed eight sacks. After starting 14 games at left tackle in 2015, he moved to guard last year but was “overwhelmed,” according to PFF. He went on injured reserve in October following knee surgery. 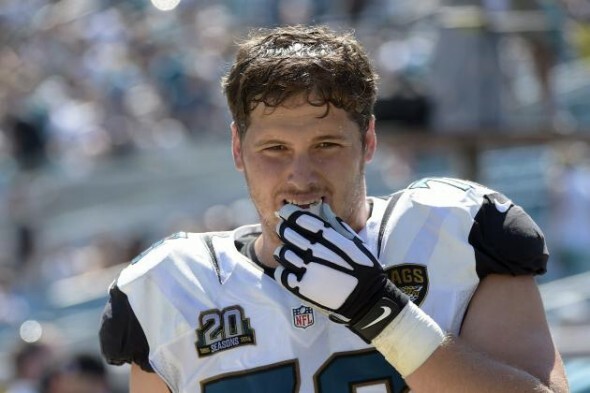 Joeckel became an unrestricted free agent because the Jaguars declined to exercise their fifth-year option on his contract or negotiate a new deal. At 6-foot-6 and 315 pounds, Joeckel is primarily a left tackle. But his time at guard improves his chances to back up or replace at two positions. Also Thursday, the Seahawks tendered RT Garry Gilliam. He was the only one of Seattle’s restricted or exclusive-rights free agents to receive an offer. CB Deshawn Shead, ILB Brock Coyle, DB Steven Terrell, DB Mohammed Seisay, TE Brandon Cottom, CB Stanley Jean-Baptiste, DE Tavaris Barnes, TE Ronnie Shields, WR Tyler Slavin and FB/TE Joe Sommers were not tendered and are now unrestricted free agents. At least five unrestricted free agents indicated Thursday that they intend to visit Seattle, probably as early as next week: RBs Jamal Charles (Kansas City), Eddie Lacy (Green Bay) and Latavius Murray (Oakland), OG T.J. Lang (Green Bay) and SS J.J. Wilcox (Dallas). Lacy is also expected to visit Minnesota while Wilcox will visit Tampa Bay. The fact that the Seahawks will entertain visits from at least three running backs speaks to the durability questions about Thomas Rawls and C.J. Prosise. The Seahawks won’t hold a reunion with LT Russell Okung, who departed in free agency a year ago to sign with the Denver Broncos. Okung, a top free-agent tackle on the market, agreed to a four-year deal with the Los Angeles Chargers for $53 million, including $26 million guaranteed. There was no way Seattle could have done that deal. Ex-Seahawks LB Malcolm Smith, MVP of Super Bowl XLVIII, moved to NFC West rival San Francisco Thursday for a deal worth $26.5 million over five years. He played the past three seasons with the Oakland Raiders. After their FA signings of Harvin and Graham, I sure hope Joeckel isn’t “more of the same”. It sure looks like his career has been a serious disappointment so far and I wonder whether this guy’s salary is going to cause some bad vibes with the rest of the line. As for Okung, it looks like he must have hired an agent this time around. I’d be delighted if he plays as well as Graham has played. But if he had Harvin’s head it wouldn’t matter. I would eat this laptop if he Joeckel played as well as Graham. Harvin and Graham were acquired by trade. Joeckel isn’t a signing of that caliber. I doubt whether much of his salary is guaranteed. No threat here. Okung consulted with a non-registered agent, but Okung did the work. He’s not making that much for a high talent, injured, underachiever… incentive based. Low risk, high reward. I like it!!! Joekel at on of the guard spots makes us MUCH better….bye-bye Glowinski or Ifedi. Even better….put a one time can’t miss LT (that did) at RT for Gilliam. Glowinski and Ifedi are safe. Joekel is insurance, not a savior. Agree about LG and RG…. however, if Joekel is healthy, I think that Gilliam is in trouble. A good thing!! Can Cable save Joekel? Can Fant save Wilson when Joekel goes down? Can Britt play 2 positions at the same time for the same money? The Hawk O-line could become even more famous this year and who knows for what . . .
You ask many questions that are unknowable prior to Labor Day. Re-ask then. Just having a smartass moment . . .